This article originally appeared in the Eagle News on January 14, 2015 and has been republished with the author’s permission. Bill Stauffer has been there since the beginning. He was there in 2002 when Alico Arena was built and the Florida Gulf Coast University basketball teams played their very first season. He was there in 2011 when FGCU finally earned its Division I status. He was in Tallahassee in 2012, watching the women play in the school’s first appearance in a D-I NCAA basketball tournament. He was there in Philadelphia and Arlington in 2013, while the rest of the world was still learning FGCU’s name. Bill Stauffer has been there all these years, leading the familiar chant from his seat in the dead center of Section S.
“Goooooo Eagles!” Stauffer yells to a standing-room-only crowd at Saturday night’s double-header conference season start against Stetson. Stauffer’s call is echoed by 4,633 people throughout Alico Arena. The battle cry of students and fans grows progressively louder each time. Now 13 years later, known to the students simply as the “Go Eagles Guy,” Stauffer can (seemingly effortlessly) entice a sold out crowd to join in without skipping a beat. The chant eventually caught the attention of the FGCU cheerleaders, who picked up the chant and unofficially adopted Stauffer as a walk-on. Although you may not catch him at every game with his personalized megaphone, Stauffer’s voice, laced in a thick Pennsylvania accent, carries outside the walls of Alico. The three-branch veteran served in the United States Army and Marine Corps as a Chinese-Mandarin translator and interpreter after graduating from the Army Language School and Maryland University. In addition to Stauffer’s three years with the U.S. Army, he served three years in the Marine Corps and 20 years as a Naval officer before retiring from the Department of Defense and moving to Bonita Springs in 2001. 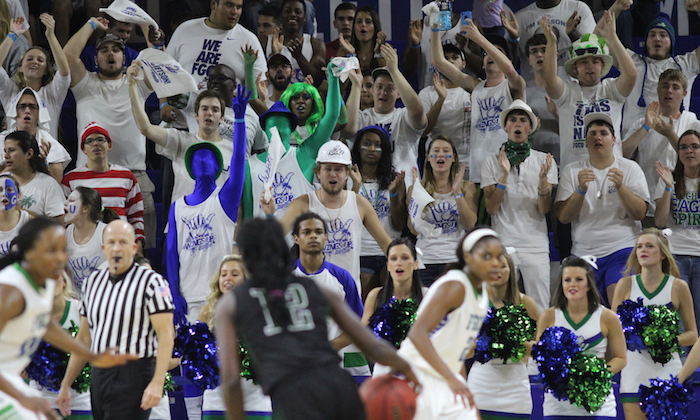 Inside Alico, Stauffer’s efforts to prevent a dull crowd, even when the team isn’t winning, has students taking notice. Stauffer brought the chant with him after attending games of his formerly adopted hometown team, UC Santa Barbara, a foe the men’s team took on twice this season. Bill Stauffer knows how to charge up a crowd because he’s been there since the beginning, leading the chant.